The students also learn to care for the garden in this program. The additional benefit of this program is that not only does the garden help teach the next generation about the criticality of native landscaping, but the gardens provide needed native landscaping within the High Country’s more-populated areas. Hardin Park School is the pilot for the program. 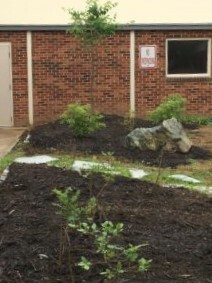 Funds for this project were provided by a grant from the National Audubon’s Coleman and Susan Burke Center for Native Plants. This grant funding was then matched by a grant from the North Carolina Native Plant Society’s B.W. Wells Stewardship Fund. Donations from Foggy Mountain Nursery and Highland Landscaping Supplies contributed to the project. Volunteers from both HCAS and the Blue Ridge Chapter of the Native Plant Society planted the shrubs and trees. The students from Hardin Park School planted the perennials.